Pictured from left to right: Alli Bacani, Debbie Martinez, Skylar Karle, Ramiro Merino, Maria Cordoba, Isabel Hernandez, Bree Rodriguez, and Jasmine Lara. Center: Victor E. Bulldog, III. Not pictured: Aamiah Finley, Gabby Gaona, Evelyn Khin and Kina Moua. 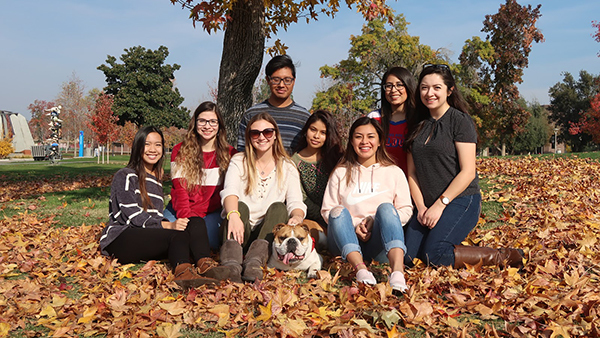 The Division of Student Affairs and Enrollment Management is really amping up its online efforts through the Bulldog Social Squad (BSS), a diverse team of 12 students from across campus. The squad will promote the division and the University through social media takeovers. "The Bulldog Social Squad will be the student voice that will help us promote the vast services and programs being offered for students,” said Dr. Janell Morillo associate vice president, Student Health, Counseling and Wellness. Members of the Bulldog Social Squad are savvy student social-media influencers who are involved on campus and who offer creative storytelling approaches, notes Amanda Stewart, communications and media coordinator for the Office of the Vice President for Student Affairs and Enrollment Management. Members of the team (which includes two graduate students) have majors ranging from public relations to biochemistry. "We are excited to see the Fresno State student experience through the eyes of the Bulldog Social Squad and learn from them how we meet and impact our students sense of belonging as a division,” says Dr. Frank R. Lamas, vice president for Student Affairs and Enrollment Management. The Bulldog Social Squad officially begins producing digital content spring 2019 semester. You can watch Aamiah (first year student) and Bree (graduate student) do their first takeover at the Spring Clubs and Orgs Fair here. See them in action on Bulldogs Tell, the central Facebook, Instagram, and Twitter accounts for the Division of Student Affairs and Enrollment Management. Each site shares the real stories of Fresno State students, highlighting the programs and student support services offered within the division. For more information, follow Bulldogs Tell on social media, or contact Amanda Stewart at amstewart@csufresno.edu. If you would like the Bulldog Social Squad to help you promote your event or program, let Amanda know. If you know of students who you think we should feature, encourage them to fill out this form.